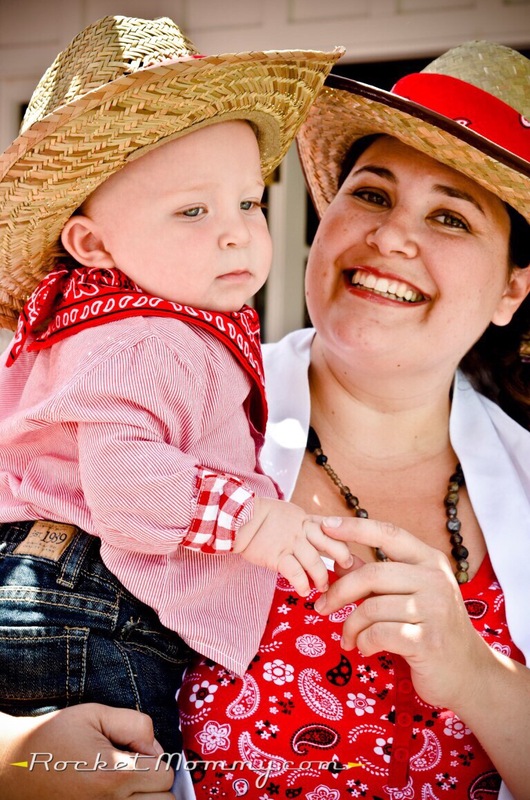 This is the last birthday retrospective post – we didn’t have a big blog-worthy second birthday party for G because I was 35 weeks pregnant with twins and I didn’t know if I’d be on my feet or in the hospital or caring for newborns at that point. But for G’s first birthday? 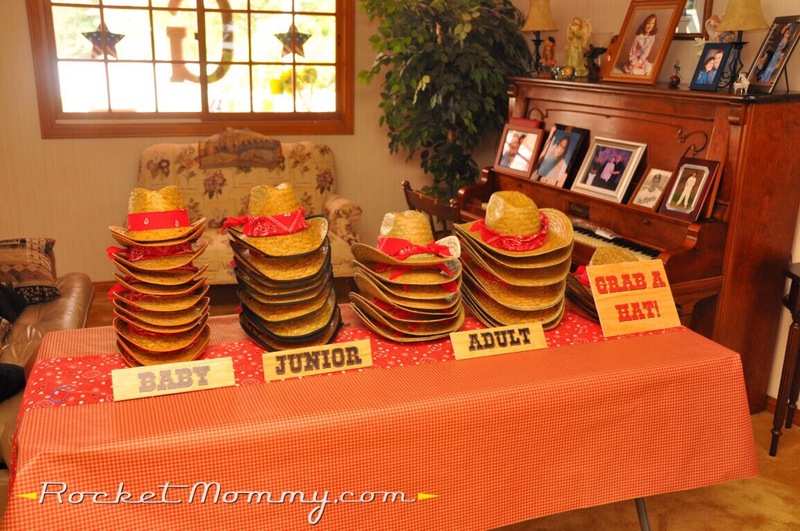 My first child’s first birthday? It was a blast! 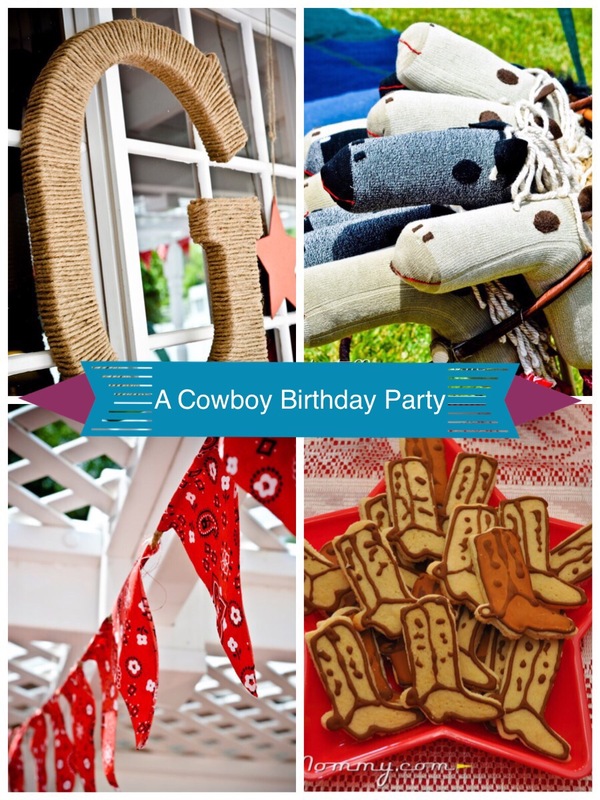 You can check out the pinboard for this party here. 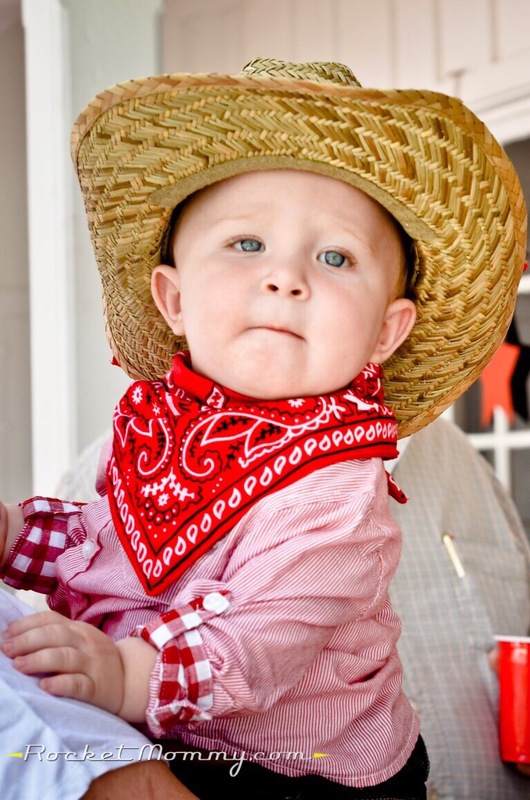 My husband chose the theme – he said out of the blue that we should have a “cowboy party,” and I was like, sure, I can work with that. 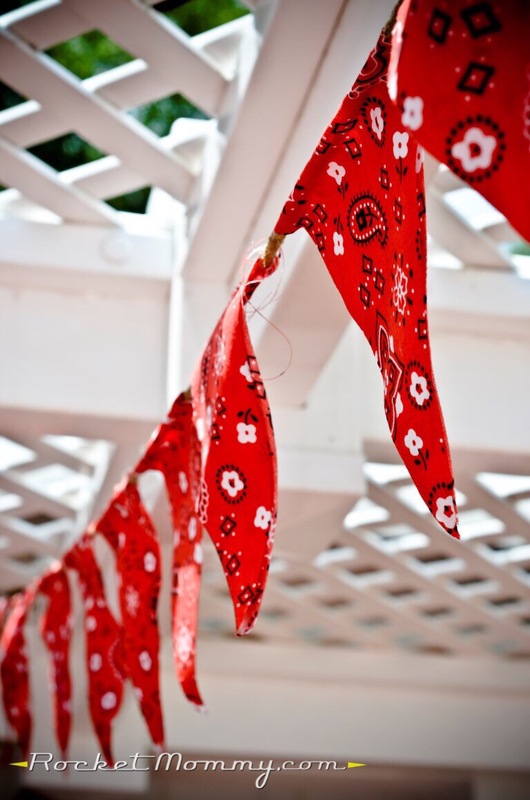 I pinned a billion different ideas for decor and favors, and I settled on a motif of red bandanas to tie most of the rustic elements together. This was the invitation that I put together. I printed a bandana pattern on the piece of backing cardstock and printed the top panels on parchment. 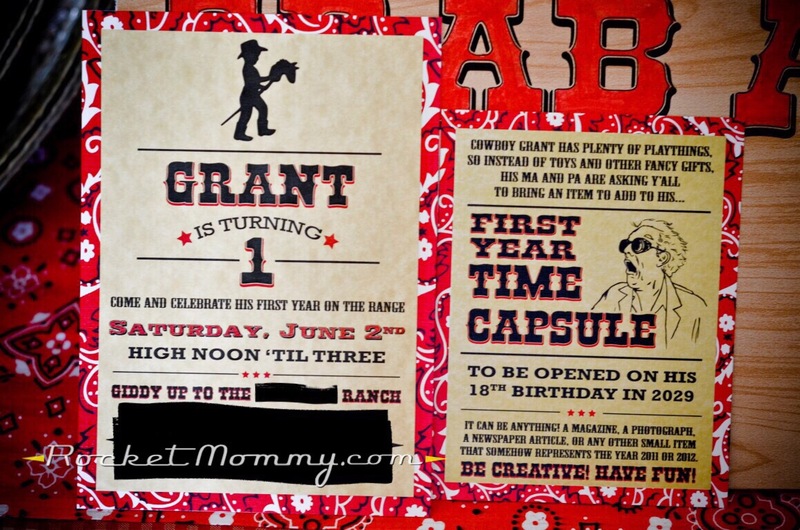 As with the circus party, we asked our guests to do something non-traditional with gifts – we asked them to bring something for G’s “first year time capsule,” something that somehow represented the year 2011 or 2012 – so I created an insert to go with the main panel. I was shocked by how many people didn’t recognize the Doc Brown illustration! 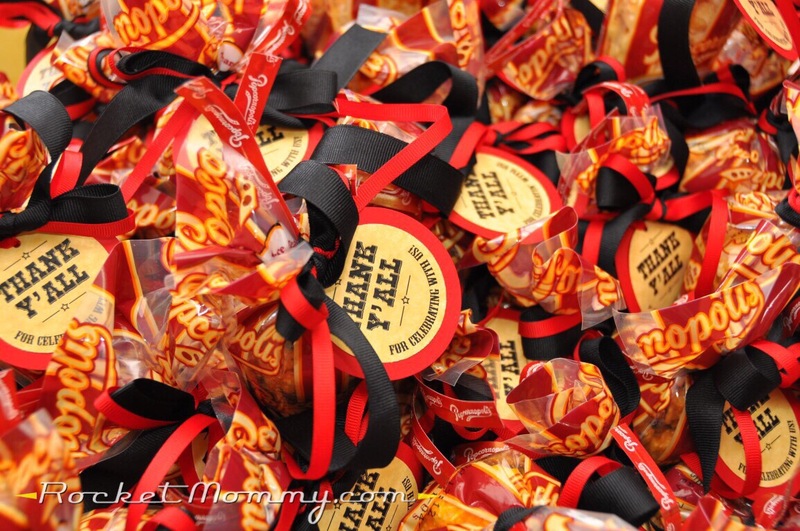 If you have guests who are fun and who aren’t dead-set on tradition, this can be really fun. I was so impressed to see what people came up with. G got magazines, newspapers, baseball cards, pins from the Olympics, space shuttle memorabilia, books, sports pennants, and many more awesome things. All of it fits in a container that’s about the size of a standard file box. It should be really interesting to look at when he turns 18! Moving on to the actual party. I hit up the wholesale district downtown and found bandanas and cowboy hats by the dozen in multiple sizes, so I got enough for all of the guests. 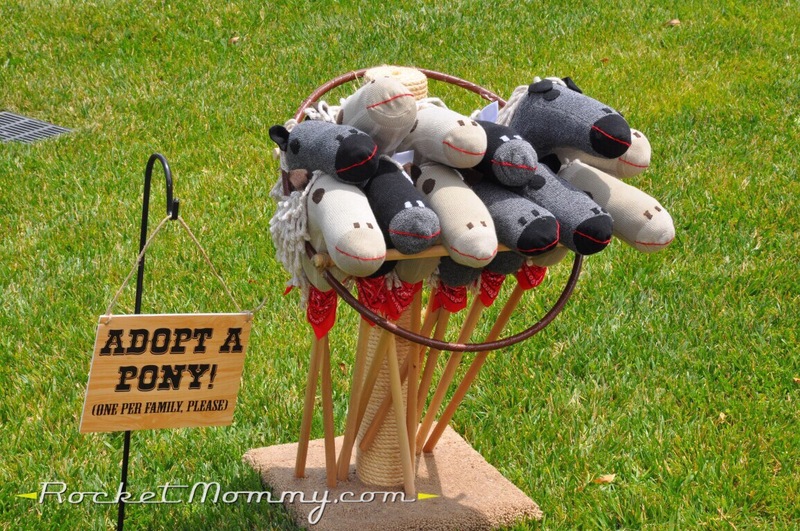 I found an awesome tutorial on Pinterest for DIY stick horses made like sock monkeys, and I thought they were super fabulous and decided to make one for every kid who attended. I didn’t want to spend a ton on the traditional socks with the red heels, so I hit up Target and bought a couple of multi-packs of colored socks from the men’s department. 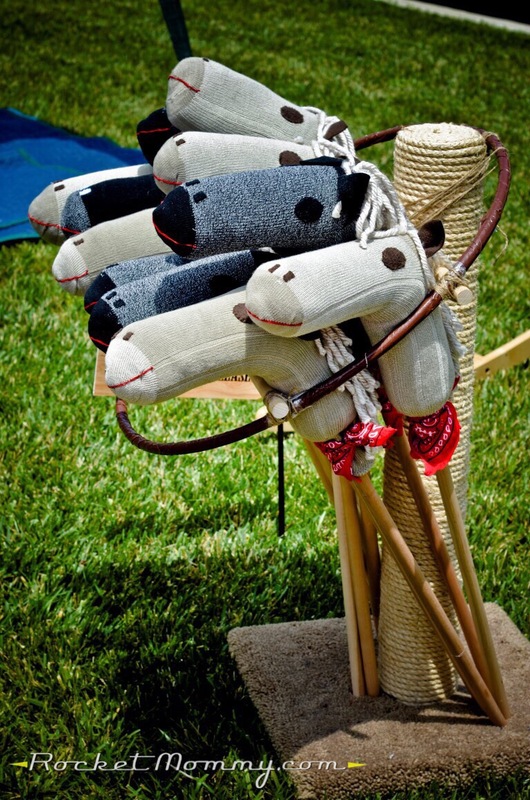 I kind of liked the different colors of hobby horses that resulted! I followed the directions in the linked tutorial with a few changes – the biggest one was that instead of just using batting to stuff the heads, I used pool noodles and wrapped some batting around them. They made a firmer base and were a lot cheaper than having to use that much batting. 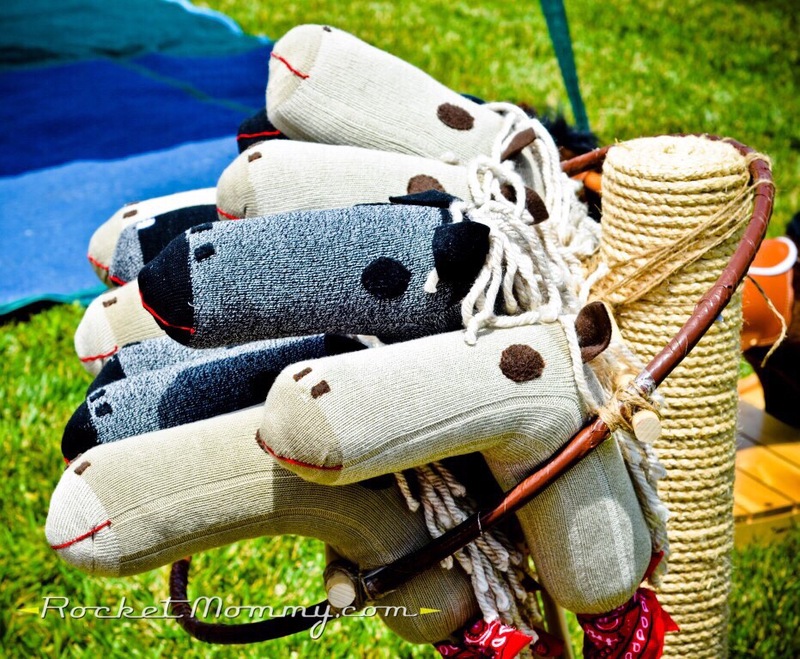 The horses were a huge hit, and I still see many of them hanging out in our friend’s playrooms when we visit their houses. The hitching post was a last-minute idea that I cobbled together from one of our old scratching posts and a hula hoop wrapped in brown tape. 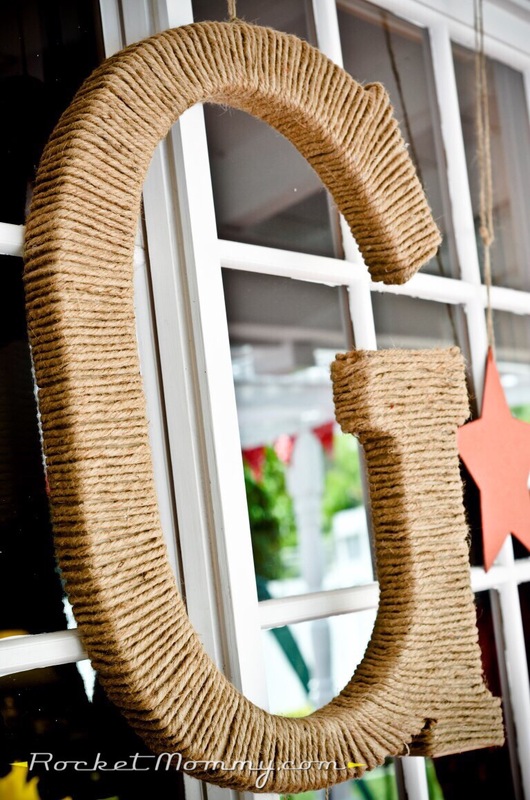 This DIY rope letter was a pretty easy decor piece to make. Joann’s sells these very large papier-mâché letters, and I just bought a big roll of cheap jute rope and started wrapping and hot gluing it down. I burned my fingers a zillion times, but it was a pretty quick project. 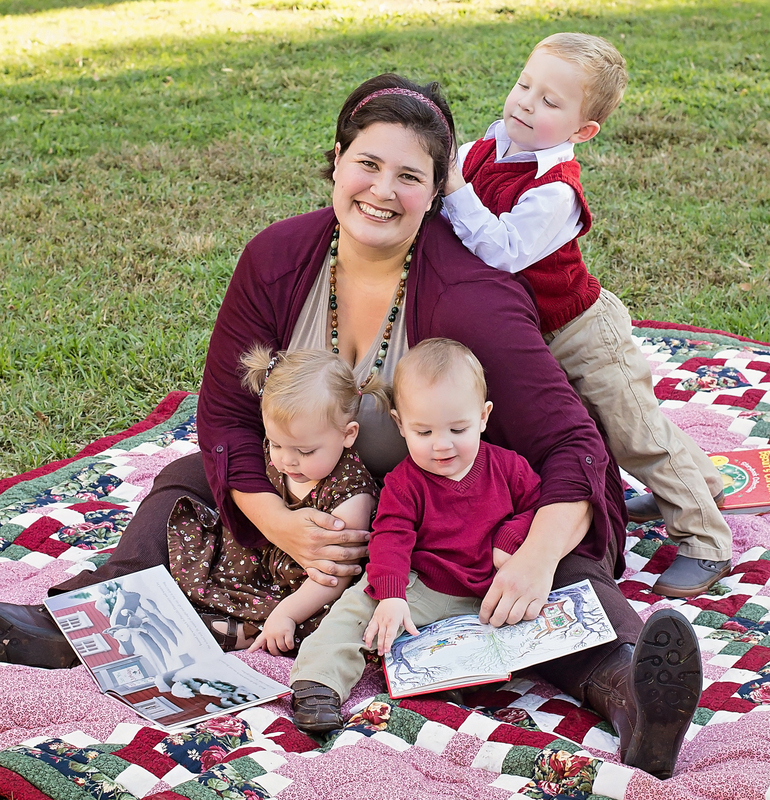 After seeing this blog post, I created these no-sew bandana bunting banners strings out of red bandana fabric that I bought by the yard – I was browsing through one of my favorite places to buy cheap ribbon and happened upon a bolt of it in their limited fabric selection. Clearly it was meant to be! We had a few strings of these flags hanging overhead for color. They are super easy to make – you cut the fabric into a diamond shape, lay the rope across the middle and glue it, fold the fabric over the rope to make a triangle, and glue the edges down. 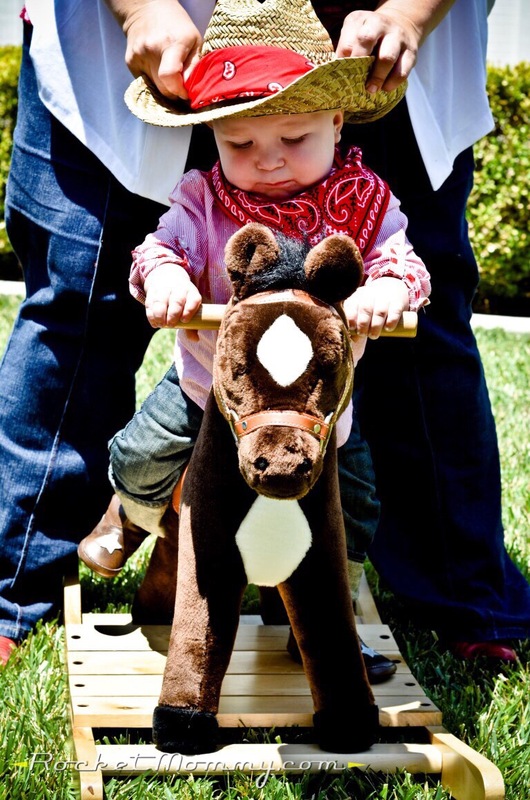 This cute little rocking horse showed up at a local resale shop, and I grabbed it to use for the party. It was great for photos! We bought mini cones of Popcornopolis (yum!) at Costco to give out as favors to the adults, and I created these tags for them. This was my first-ever attempt at making sugar cookies decorated with royal icing. It was kind of a disaster, haha. 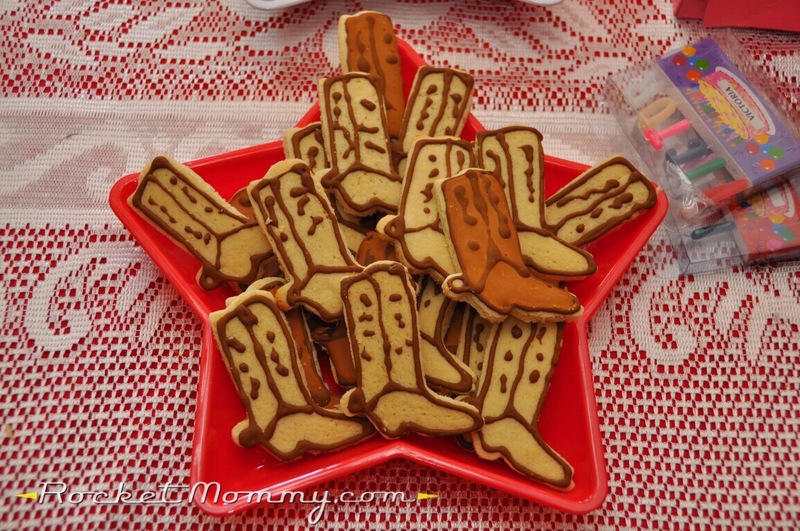 In case it’s not obvious, those are supposed to be cowboy boots. I’ve improved since then, but my food-related crafts are generally among my less successful endeavors. Our local grocery store ran a coupon for $10 off of $20 in their floral department the weekend of the party, so while I didn’t initially intend to do any kind of floral decor, I couldn’t pass up a deal like that! I spent $10 on $20 worth of sunflowers, which was plenty to decorate all of our tables, and tossed them into some mason jars my dad had laying around in the garage. 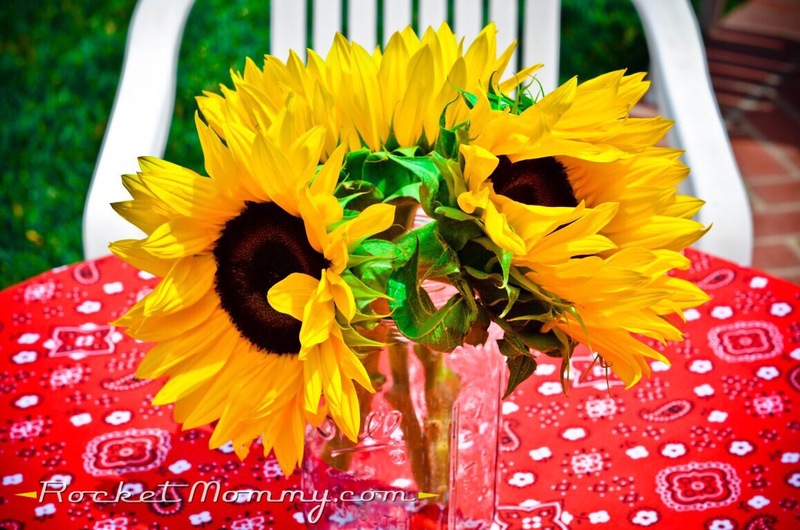 And I used the bandana fabric to make some easy square table toppers.